Despite strong Byzantine influence, Bulgarian artists and architects created their own distinctive style. In the 14th century, during the period known as the Second Golden Age of Bulgarian culture, literature, art and architecture flourished. The capital city Tarnovo, which was considered a "New Constantinople", became the country's main cultural hub and the centre of the Eastern Orthodox world for contemporary Bulgarians. After the Ottoman conquest, many Bulgarian clerics and scholars emigrated to Serbia, Wallachia, Moldavia, and Russian principalities, where they introduced Bulgarian culture, books, and hesychastic ideas. 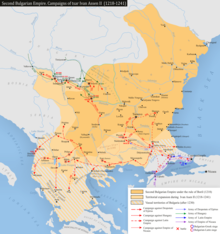 The defeat of the anti-Ottoman coalition in the battle of Nicopolis in 1396 was the final blow leading to the fall of the Bulgarian Empire. The Medieval Bulgarian royal charters, such as the Rila Charter of Ivan Shishman issued in 1378, are an important source on medieval Bulgarian society and administrative posts. The Emperor held supreme power over secular and religious affairs in an autocracy; his personal abilities played an important role in the country's well-being. When the monarch was an infant, the government was headed by a regency that included the mother-empress, the Patriarch, and senior members of the ruling dynasty. As the processes of feudal fragmentation accelerated in the 14th century, it became customary for the monarch's sons to receive imperial titles during their father's lifetime; sons were styled co-rulers or junior emperors. The Patriarchal Cathedral of the Holy Ascension of God in Tarnovo was the seat of the Bulgarian Orthodox Church during the Second Empire. It was part of a larger complex which accommodated the Patriarch. ^ a b c Kamburova, Violeta (1992). Atlas "History of Bulgaria". Sofia: Bulgarian Academy of Sciences. pp. 18, 20, 23. ^ Тютюнджиев, Иван; Пламен Павлов (1992). Българската държава и османската експанзия 1369–1422 (in Bulgarian). Велико Търново. ^ "S. Runciman - A history of the First Bulgarian empire - Index". Promacedonia.org. Retrieved 5 May 2018. ^ Karloukovski, Vassil. "V. Zlatarski - Istorija 1 A - Index". promacedonia.org. ^ Kenrick, Donald (2004). Gypsies, from the Ganges to the Thames. University of Hertfordshire Press. p. 45. ISBN 1902806239. ^ "Encyclopædia Britannica: Vlach". Retrieved 20 September 2011. ^ Kolarz, Walter (1972). Myths and Realities in Eastern Europe. Kennikat Press. p. 217. ISBN 0804616000. ^ Boia, Lucian (1972). Romania: Borderland of Europe. p. 62. ^ Делев, Петър; Валери Кацунов; Пламен Митев; Евгения Калинова; Искра Баева; Боян Добрев (2006). "19. България при цар Иван Александър". История и цивилизация за 11-ти клас (in Bulgarian). Труд, Сирма. ^ Nicolle, David; Angus McBride (1988). Hungary and the Fall of Eastern Europe 1000-1568. Osprey Publishing. p. 24. ^ a b c "History of the Bulgarian Orthodox Church". Official Site of the Bulgarian Patriarchate (in Bulgarian). Retrieved 2 February 2014. ^ "Патриаршеската катедрала "Свето Възнесение Господне"" [The Patriarchal Cathedral of the Holy Ascension of God] (in Bulgarian). Православие. Archived from the original on 22 February 2011. Retrieved 8 November 2014. ^ Grabar, André (1928). La peinture religiouse en Bulgarie (in French). Paris. p. 95. ^ a b "Boyana Church". Official Site of UNESCO. Retrieved 4 November 2014. ^ a b "Rock-Hewn Churches of Ivanovo". Official Site of UNESCO. Retrieved 4 November 2014. ^ Иванов, Йордан (1970). Български старини из Македония (in Bulgarian). Sofia: Българска академия на науките. pp. 296–305, 359–367, 387–390. ^ Ostrogorsky, George (1969). History of the Byzantine State. New Brunswick: Rutgers University Press. p. 476. Иречек (Jireček), Константин (Konstantin) (1978). "XXIII Завладяване на България от турците (Conquest of Bulgaria by the Turks)". In Петър Петров (Petar Petrov) (ed.). История на българите с поправки и добавки от самия автор (History of the Bulgarians with corrections and additions by the author) (in Bulgarian). София (Sofia): Издателство Наука и изкуство. Фоменко (Fomenko), Игорь Константинович (Igor K.) (2011). "Карты-реконструкции = Reconstruction maps". Образ мира на старинных портоланах. Причерноморье. Конец XIII — XVII в. = The Image of the World on Old Portolans. The Black Sea Littoral from the End of the 13th — the 17th Centuries (in Russian). Moscow: «Индрик» (Indrik). ISBN 978-5-91674-145-2. The Battle of Philippopolis or Battle of Plovdiv took place on 30 June 1208 in the surroundings of Philippopolis between the armies of the Bulgarian Empire and the Latin Empire. The Crusaders were victorious. 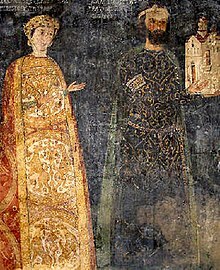 Irene Komnene Doukaina or Eirene Komnene Doukaina was an Empress of Bulgaria during the Second Bulgarian Empire and Byzantine princess. She was the third wife of tsar Ivan Asen II of Bulgaria. She was the mother of tsar Michael Asen I of Bulgaria. Kutmichevitsa was an administrative region of the Bulgarian Empire as well as Byzantine Empire during much of the Middle Ages, corresponding roughly with the northwestern part of the region of Macedonia and the southern part of Albania, broadly taken to be the area included in the triangle Saloniki-Skopje-Vlora. It had an important impact on the formation, endorsement and development of the Old Church Slavonic and culture. The Debar–Velich diocese of the Bulgarian Orthodox Church was created in Kutmichevitsa whose first bishop between 886 and 893 was Clement of Ohrid, appointed by Knyaz Boris I.
Ivan Asen II, also known as John Asen II or John Asan II was emperor of Bulgaria from 1218 to 1241. He was still a child when his father, Ivan Asen I–one of the founders of the Second Bulgarian Empire–was killed in 1196. His supporters tried to secure the throne for him after his uncle, Kaloyan, was murdered in 1207, but Kaloyan's other nephew, Boril, overcame them. Ivan Asen fled from Bulgaria and settled in the Rus' principalities.